I’ve really had a thing for mustard lately, specifically Dijon. I don’t know what it is, but I’ve been using Dijon nearly every chance I get. I think it’s safe to say I’m definitely in a mustard phase. It adds such a nice flavor and when something seems like it’s missing from a recipe, Dijon seems to take care of that. It’s easy to find good quality Dijon mustard that doesn’t have any sugar or junk ingredients in it either. Sorry, Grey Poupon won’t cut it. On another note, I’m going to a healthy fats demo at Whole Foods this weekend. Remember my friend, Ashley at Craving4more? She hosted a sauerkraut tasting that I went to last weekend, and invited me to the fats presentation this weekend. I believe the healthy fats she’s including are coconut oil, ghee, avocado and grass-fed tallow (house-made from the Whole Foods meat dept). I imagine it’ll be pretty great. I’m not really sure what else I’ll be doing this weekend, other than grocery shopping and working Sunday morning, but I like not having much of an agenda. What I really need to be doing is reading/studying for my exercise science class, but I’m still waiting for my book to arrive in the mail. Hopefully, it’ll get here soon because that class moves fast and the material is complex, so I don’t want to get too behind! Melt ghee in a medium-sized skillet over medium heat. Add the garlic and celery and stir. Allow to cook a few minutes, until slightly softened. Then, add to the slow cooker. Season the roast with sea salt and pepper. Then, in the same pan, add the pork shoulder roast. Add a little more ghee if necessary. Brown the roast about 2-3 minutes each side and then place inside the slow cooker. Add the chopped apple as well. In a small bowl, whisk together the chicken broth, mustard, parsley, marjoram and thyme. Add a dash of sea salt and pepper, if desired. Pour on top of the roast and place the lid on the slow cooker. Let cook on low for 6-8 hours or on high for 4-5. 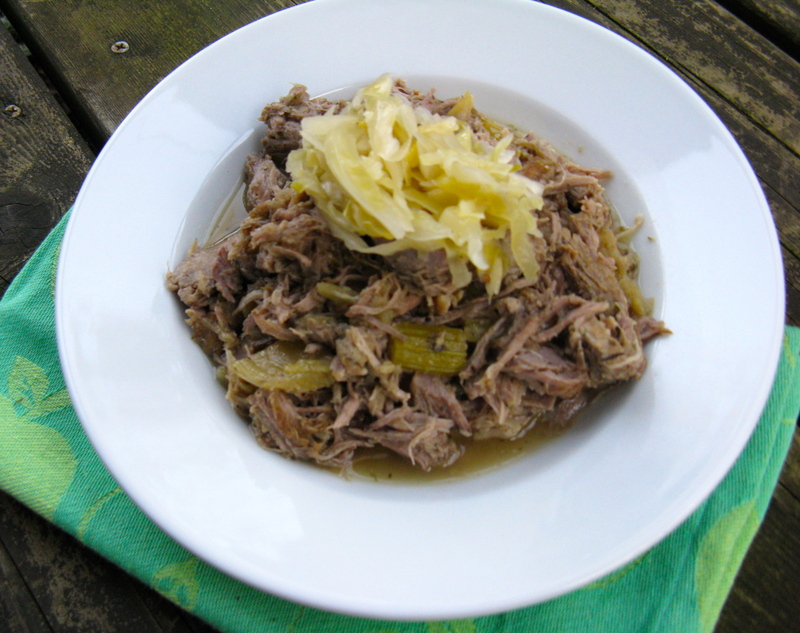 Once done, cut string off of pork roast, if need be, and shred with two forks. Serve with caraway sauerkraut on top, if desired. 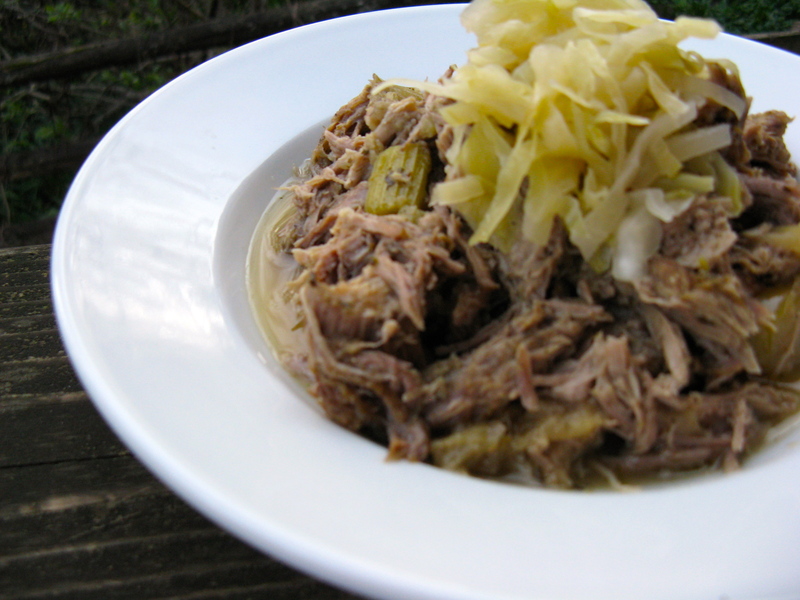 Oh my…tender meat, pink lady apples, and sauerkraut. I don’t think it gets any better than that! 🙂 Oh wait…maybe some almond butter and coconut butter mixed together for dessert! See you soon. I thought you’d like this one 🙂 I’m so inspired to use sauerkraut all the time now! Looks delicious!!! We’re just hanging at home & painting!